On 15 March 2006, the General Assembly adopted resolution A/RES/60/251 to establish a Human Rights Council replacing the Commission on Human Rights. The Human Rights Council began its work on 19 June 2006. Just as QUNO participated actively in the Commission on Human Rights it now works with the UN Human Rights Council, seeking ways to strengthen the Council’ s work in promoting and protecting human rights. 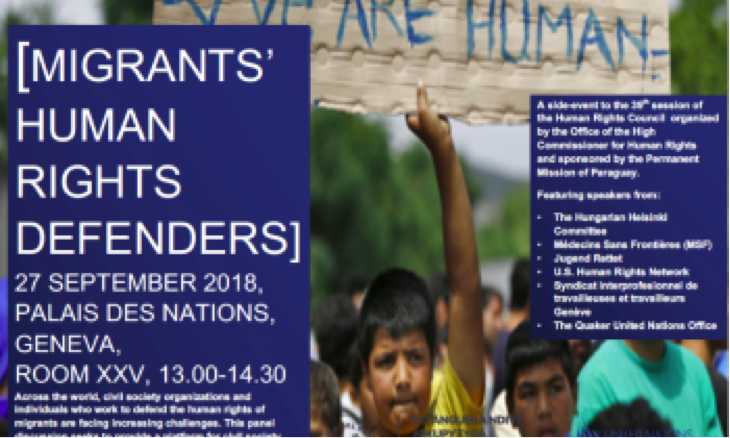 On Thursday 27th September at the 39th Human Rights Council, Human Rights and Refugees representative, Laurel Townhead, spoke at a side event on migrants' Human Rights defenders, organized by the Office of the High Commissioner for Human Rights and sponsored by the Permanent Mission of Paraguay. Laurel centered her presentation on the crucial role Human Rights defenders play in offering a counter narrative of compassion in an increasingly xenophobic global climate. She stressed how vital the witness of migrants' Human Rights defenders has been in creating the Global Compact for Migration, and how important it is now to celebrate its adoption, to ensure it has tangible power in improving the lives of people on the move. QUNO will be at the Intergovernmental Conference in Marrakesh this December, where the compact will be formally adopted. The statement focused on the clarity on criteria for lawful use of immigration, and highlighted elements of the deliberation focused on the prohibition of the deprivation of liberty of children, the duty of individualised assessment, and the presumption of alternatives to detention. It tied these aspects of the Deliberation to the Global Compact for Safe, Orderly and Regular migration, and asked the Working Group to consider how they will work with States to support and advise them on the implementation of the Compact.